I ‘met’ the author of Lipstick City Guides, Debbie Lindsay, through LinkedIn: I was intrigued by her book and she very kindly sent me a copy. However, not withstanding the free book, if you’ve read my book review policy you know that I only review books that I think will interest my female readers; I’m not a professional reviewer and have no vested interest in either bigging up or demolishing any book . So let me begin by saying if you are planning a trip to the Big Apple I think this is a very good book to have by your side. Written from a female perspective, and geared towards our interests, this is a fun travel guide with a glossy feel, handbag friendly and easy to use. Yes to all of that. But lest you think it’s full of trite condescending stuff let me reassure that it most definitely is not. It is a blend of all sorts of things from guides to good tea and cake shops to a tour of the financial sector. You can read about restaurants and acting agencies, all beautifully illustrated with the author’s own photographs taken when she spent time alone in New York. And if you want to get married in New York she’ll even tell you how to do that too. 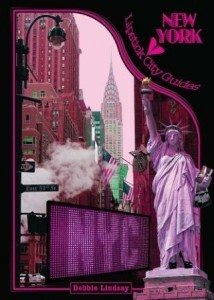 I haven’t been to New York for a very long time but this book from Debbie had me itching me to take a trip very soon! You can buy the book for about £15 from Amazon or via the blog for the lipstickcityguides.